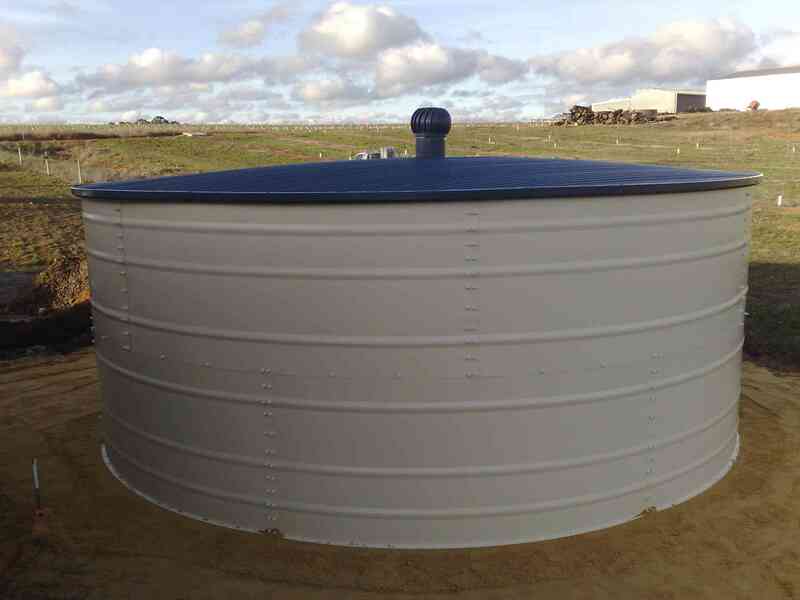 Click here to view our Steelfab Steel Liner Tank sizes. Bluewater Tanks are agents for Steelfab Global in the South West and Great Southern areas. 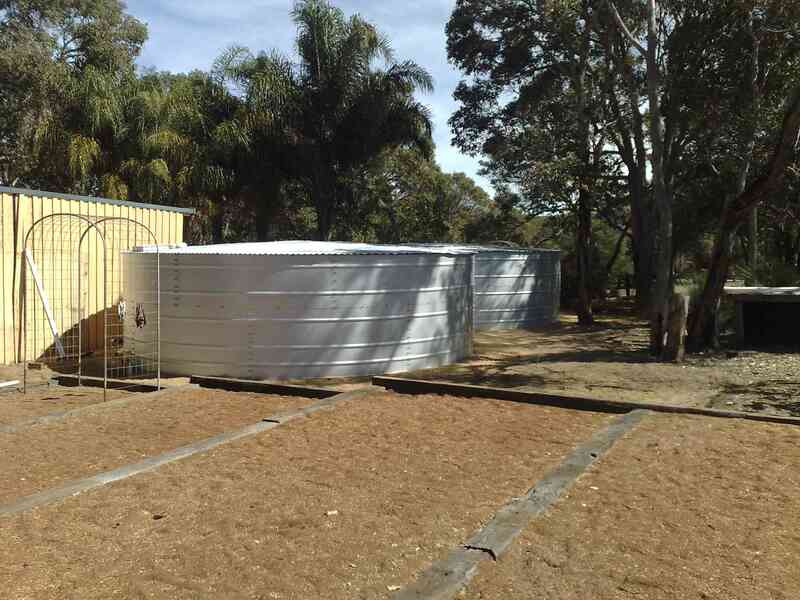 The Steelfab Aquadome Tanks are designed and built to withstand Australia’s harsh climate conditions. These steel liner tanks are purposefully designed to not only withstand the extreme weather temperatures, but also are robust enough to take what ever the Wild West can throw at it. They now carry up to a 25 year pro-rata warranty. 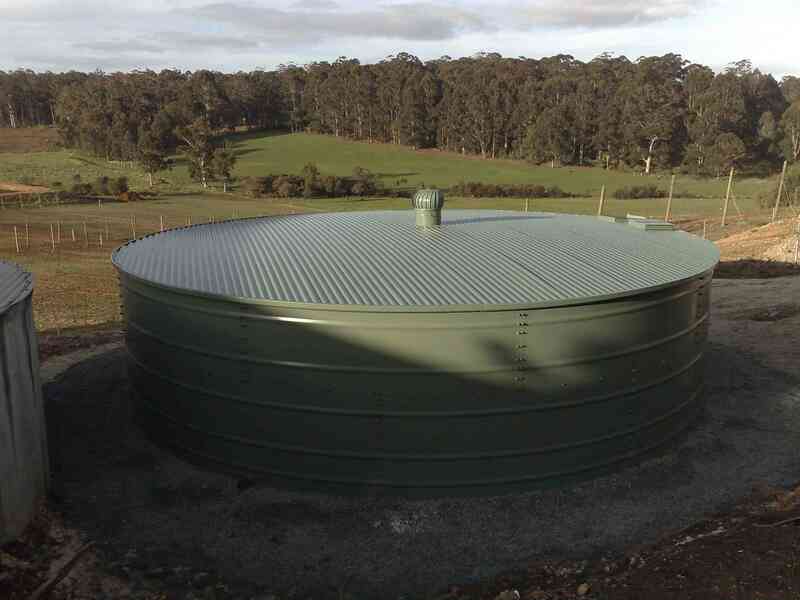 The stringently engineered Aquadome water tank gives farmers and rural property owners a safe, reliable water storage product that has greater strength, with minimal liner movement. Two very important objectives have been achieved in the manufacture of these tanks; structural integrity and minimal movement of the liner. How important is your water? We place a very high importance on saving water and only use a liner that is capable of being repaired while either wet or dry. It is paramount to us that people in rural or remote areas know that in the possible event of a leakage, that their liner can be repaired without having to loose too much water. 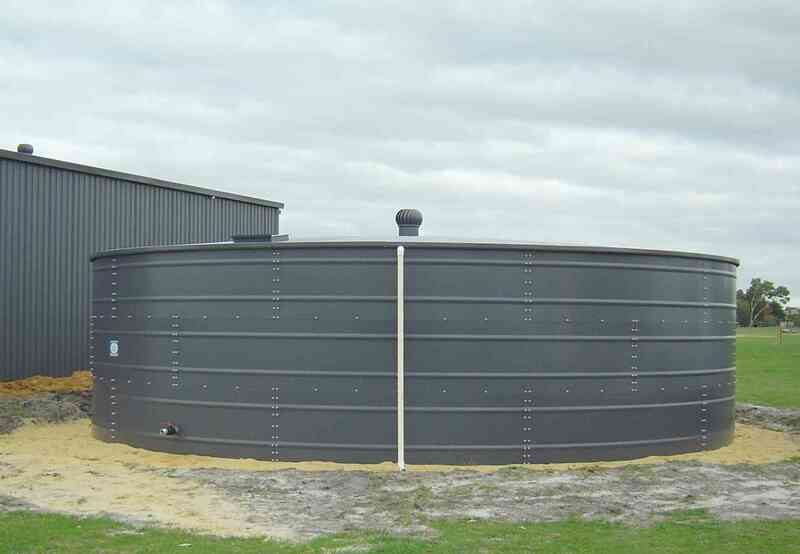 We service the South West and Great Southern regions of Western Australia regularly travelling throughout these area’s to build rural water storage tanks, as well as repairing other tank manufacturer’s water tanks, liners and tank roofs. Click here to see our Liner & Refurbishments page. Bluewater Tanks draws on extensive expertise to provide the highest quality advice on commercial, industrial and fire-water storage tank systems. Each tank project has our individual attention so that our valued clients can have the confidence in knowing that the solution we provide will meet all their requirements. A reliable safe water storage tank is one of the most important items you will ever invest in, after all we cannot live without clean water! Bluewater Tanks understands this and that is why we have chosen to work with the leaders in the industry for both design and material strength. With our commitment to providing tanks that are of a high quality, cost effective and have longevity we supply an extensive range of water storage tanks. 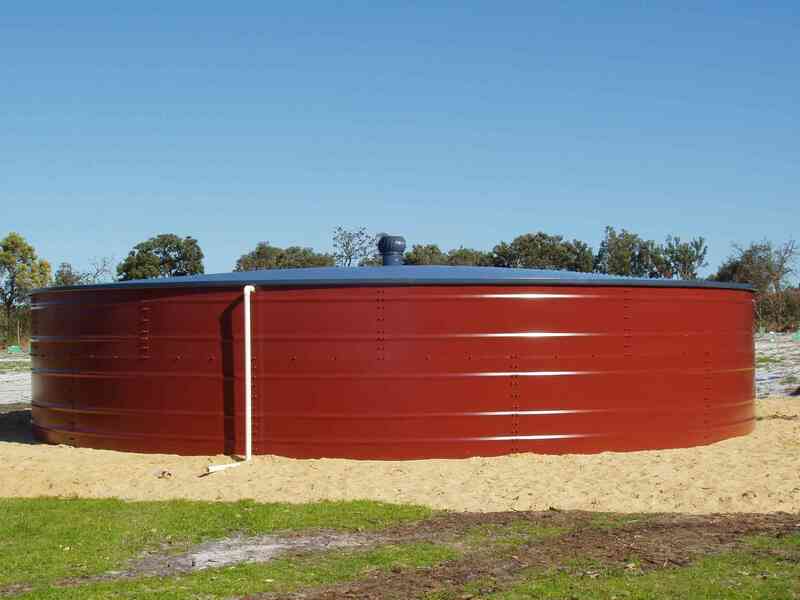 These tanks are designed to all relevant Australian Standards and rated for the storage of potable or drinking water. This means that you can have complete peace of mind when you invest in your family’s health, wellbeing and future. Food grade certified liner to AS/NZS 4020:1999 Standards. 1 x Inlet filter basket to match tank colour with mosquito proof removable leaf strainer. 1 x Access hatch to match colour of tank (Manhole). 1 x 50mm overflow outlet with overflow pipe. 1 x 50mm outlet with ball valve. Bolt covers for extra safety and aesthetics. 1 x Whirly bird for added anticorrosion and water quality. 1 x Removable Galvanised Ladder. Flashing (edging on the tank roof) for safety and aesthetics. 1 x 50mm fire outlet with ball valve and camlock for fire fighting purposes. With the superior quality of the solid liner that is manufactured in-house to Australian Standards AS4020; Drinking Water. You have complete peace of mind as this liner is strong and flexible and will secure your water better than any other liner can. Our design team will assist you in tailoring a water storage solution to your needs. Contact us today.